For over half a century CCI has been producing the best small caliber rimfire ammunition in the world. CCI Varmint and Target ammunition is loaded with the Speer VNT polymer tipped projectile. This bullet has a very thin jacket combine with a precision built polymer tip. This gives you amazing accuracy and devastating terminal ballistics on small game and varmints. It's a flat shooting highly accurate round that maximizes it's effective range. With premium powder and consistent CCI primers, VNT is setting the new standard in precision rimfire ammo. 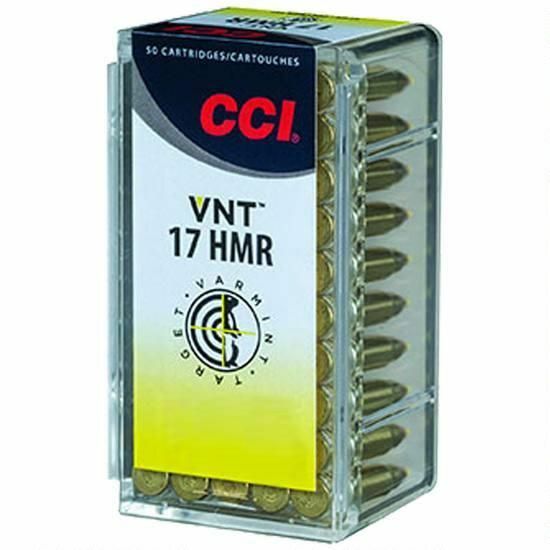 Whether you're competing on the range or clearing varmints from the homestead, make sure you're loaded up with CCI VNT! Pick up some CCI and see for yourself why this is the best small caliber target and hunting ammunition that money can buy. Uses: Varmint Hunting, Small to Medium Game, Match and Target Shooting.